Free Trial Plan with a 500MB data cap. Connect Up To 5 Devices Simultaneously. Doesn’t Offer Live Chat Feature. P2P File Sharing Not Supported. Slow streaming speed for Netflix. TunnelBear offers outstanding features and protection regimes, swift access to the World Wide Web, strong encryption protocols, and 24/7 support for its users. TunnelBear offers free 500MB data cap to help set your mind with its service. 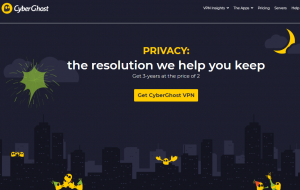 This Canadian based VPN is providing service for a long time now, it hides data and IP address of the user shield him from the potential third-party attacks. Using TunnelBear, users can safely access their emails and domestic and international news flash. It claims strict no logging policy with a military grade AES-256-bit encryption by default. With TunnnelBear you can add up to 5 devices and enjoy secure and hassle-free browsing. What TunnelBear Offers to its Users? TunnelBear might sound like a fun game, but don’t get carried away by its name it might fool you. 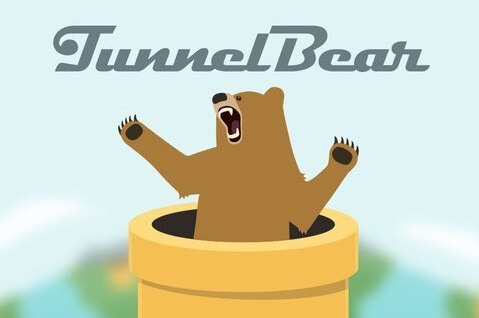 TunnelBear VPN is a service-packed VPN with many valuable features and add-ons. 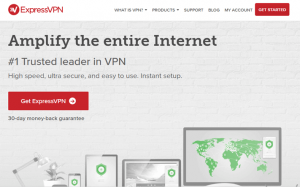 It is the easiest to use as compared to other VPNs. This Canadian-based VPN claims it won’t record your online activity which means no logging, however it does keeps logs for only a month. This hypothetically means if Canadian government asks about your data TunnelBear will only have one month of data to offer. This data does include the time of use of VPN but not the sensitive details like what websites you visited or your IP address. Encrypted by military-grade encryption 256-bit AES (Advanced Encryption Standard) TunnelBear pledges to keep your data safe and private. Additionally, TunnelBear is the only VPN to go through Independent Security Audit twice and provides best protocols including OpenVPN, IKEv2, IPsec, and L2TP. Pricing and Plans – Is it Worth the Money? TunnelBear offers three different subscription plans which are named as follows. The Little Bear is a free plan which provides a limited data of only 500MB/month. However, an additional 1GB is awarded if you tweet about the service. 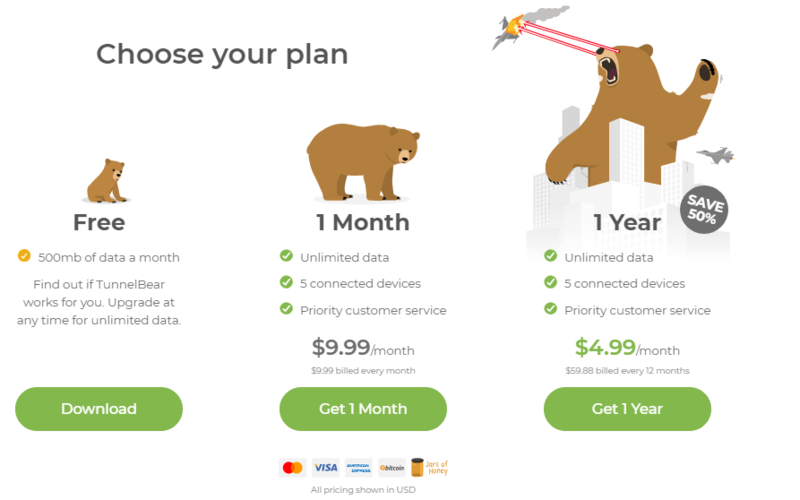 Giant Bear means service-packed unlimited data with a price tag of $9.99/month. Though this plan is appealing, the best is yet to come. The Grizzly Bear plan is the best amongst them all; you get unlimited data, feature-packed VPN service on only $4.99/monthly for a total of $59.88 annually. Savings in this plan is enormous as depicted by the size of the grizzly. Remember, there is no money-back policy which is a usual practice in the VPN industry. However, this should not be an issue, especially if you opt for a little bear plan (which is free) before subscribing with Grizzly Bear. TunnelBear is a Toronto based VPN which was founded back in 2011 by Ryan Dochuk and Daniel Kaldor. Being a native app in Canada comes to a few pitfalls like; it’s not safe using a VPN provider that is operating in Canada because Canadian laws are notorious for privacy breaches. Moreover, Canada is a member of 5-eyes countries which share intelligence details among them. This feature is also known as “TunnelBear’s Stealth mode.” What it does is, it masks OpenVPN traffic to get around firewalls by executing obfsproxy. This makes encrypted data more secure and less detectable to governments, ISPs, and businesses. A kill switch ensures that no data flows through the network interface outside the VPN tunnel when VPN connection is lost. This feature makes sure that encrypted data doesn’t leak out and your online activity is secured. Kill Switch is enabled by default in TunnelBear VPN which has a name of its own (VigilantBear). TunnelBear automatically connects you the fastest and nearest connection; it chooses the best server around automatically to provide hassle-free VPN service. Auto-tunnel determines the suitable tunnel for you and connects you to the location which has the lowest ping. When your VPN is active, the web traffic travels through an encrypted path; this is managed by the VPN service provider. This encryption keeps your information safe and secure and helps protect you against ISP selling. Similarly, when your traffic exits the web using a VPN server, it appears as if you have an IP of that server location. This protects your real identity and provides you a safe entry and exit from the internet. No matter which VPN you choose, your browser experience determines whether you will go with it or not. VPN speed is a perennial concern for consumers but not for TunnelBear users, on our review we found that TunnelBear has some fastest tunnel digging bear out there. According to our tests, TunnelBear provides blazing fast speeds on up to 5 different devices. It does not have a dedicated streaming server. Instead, there is only US option, and you cannot change that. It used to be a big deal to watch Netflix outside the US, but with many VPNs providing unrestricted access it isn’t. During our test, we couldn’t access Netflix which is disappointing; we cannot recommend TunnelBear for streaming fans. 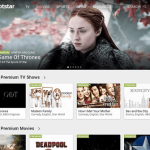 There are cases on the internet where the Android version had no problem accessing Netflix, but we cannot deduce our results from a few sources online. TunnelBear provides custom apps for popular platforms, these include; MacOS, Microsoft Windows, Android, and iOS. It also supports software with Linux but requires manual configurations and limited TunnelBear support. You need to install the app on each device you would like to protect because it’s not possible to manually configure your router. TunnelBear also offers browser extension for Firefox, Chrome, and Opera. These extensions are easy to download and install. They allow you to connect any server from their server list to hide your real IP and access blocked content. These extensions are instead proxies than a feature-packed VPN. This means that they might not offer some level of encryption and should not be used as a substitute to a desktop client. However, they are useful upon need. TunnelBear customer support is good enough but isn’t up to that mark to compete with top-tier providers. There are several options to contact the support team which include; “Getting started,” “Troubleshooting” and “Announcement” pages. We were disappointed that it does not offer live chat feature and to ask a query you first have to sign-up for an account. The email response usually takes 3-5 hours of delay which is quite frustrating when you have a limited time, and you have to wait for hours. TunnelBear is an excellent tool for beginners to experience anonymity. Small server network and unimpressive performance on the streaming website; Netflix, and no live chat support are undoubtedly some of the drawbacks of this VPN. 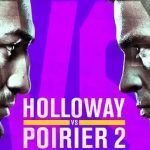 However, with its different subscription plans and feature-packed services, it is no less than a healthy competition in the market. Blazing surfing speed, strong encryption and securely connecting from 23 different countries gives TunnelBear an added advantage over other VPNs.